M3 Biotechnology is advancing a novel, potentially transformative approach for the treatment of Alzheimer’s disease and other neurodegenerative diseases. Unlike other products approved and in development, M3’s drug candidates hold the potential to reverse or halt the degenerative process. Alzheimer’s disease is a devastating and progressive neurodegenerative disease. Current therapeutics offer only symptomatic relief, and while many companies have tried to develop drugs that slow the pace of the disease or even reverse it, there has been little success in terms of approved drugs so far. M3 Biotechnology’s objective is to change this reality. From small beginnings a few years ago, the company has advanced its lead therapeutic into clinical trials in Alzheimer’s disease. M3 grew from research that emerged in Joseph Harding’s laboratory at Washington State University, USA. Harding approached Jordan-born Leen Kawas, then a postdoctoral researcher and now M3’s president and CEO, with the suggestion that she work with him to commercialize the team’s neurodegenerative disease findings. “We saw that novel com- pounds we were working on had an impact in both Alzheimer’s disease and Parkinson’s disease models, and we licensed the technology from the university. Work continued at the company on optimizing the molecules and lead identification; we selected our lead compound in 2016,”said Kawas. M3 now employs 12 people within its core team, in drug discovery and in clinical development, which is surrounded by a larger network of consultants, advisors and service providers. “We are working in the same arena as some very large pharmaceutical companies, but we see our lean operations as an advantage. We are able to be much more flexible and we have succeeded in getting to the clinic efficiently and effectively,” said Kawas. While there are many companies with a focus on neurodegenerative diseases and a number of symptomatic drugs on the market, there remains a great need for effective solutions. M3’s drug candidates employ a completely different mechanism of action to other drugs currently in development, according to Kawas; they act by activating key brain neurotrophic receptors (Fig. 1). Kawas and her team believe that their approach, which looks to restore lost or build new connections in the brain, could halt or even reverse the progress of different neurodegenerative diseases. But the indications that the company has chosen to investigate, particularly Alzheimer’s disease, are so far scattered with drugs that have not succeeded. 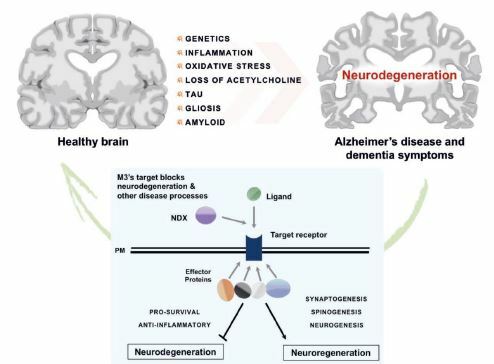 Many companies have focused on β-amyloid and the amyloid hypothesis to develop drugs to try to beat Alzheimer’s disease. “We believe that using β-amyloid as the target is where companies have failed. The β-amyloid levels are stable at diagnosis, so it may not be the main mechanism for the worsening of the disease. We need to think outside of the box,” said Kawas. “Despite the failures that we have seen in Alzheimer’s disease, there has been a lot achieved in the understanding of the pathology and presentation of the disorder, and there is also a lot of support from the regulatory authorities.”M3’s decision to enter into the neurodegeneration market was based on science and business, but also on personal associations and experiences. “To work in an area like neurodegenerative disease you need the science and business drivers, but you also need the personal links—which exist for me and members of my team—to give it energy and make it a passion,” said Kawas. Fig. 1 | M3 Biotechnology’s candidate blocks neurodegeneration and other disease processes. Classical Alzheimer’s disease treatment approaches—that typically target one of the multiple factors that contribute to disease and neurodegeneration, such as amyloid—have failed to produce a clinical benefit. M3’s novel therapies are designed to address multiple aspects of the disease, oppose the effects of neurodegeneration and increase the likelihood of positive clinical outcomes by stopping or reversing neurodegeneration, improving cognition and potentially permanently altering the course of disease. Another area in which M3 is thinking outside of the box is in its design and operation of clinical trials. “Preclinical trials don’t always translate well into clinical trials, and so we have chosen our endpoints carefully,” said Kawas. To ensure that early research progresses smoothly into later-stage development, researchers at M3 are looking at a range of biomarkers, including electroencephalogram (EEG) and functional and structural magnetic resonance imaging biomarkers, as well as plasma and cerebrospinal fluid markers. These can be used in animal studies, but have also been validated in clinical trials. This patient centricity and inclusion of patient voice should improve the clinical trial experience for patients and caregivers. This will increase recruitment rates and retention which will ultimately improve the quality of the trials. “We are heeding domestic and international regulatory guidelines and positioning our program for acceleration” said Kawas. In October 2017, M3 began testing NDX-1017, its lead small molecule, in patients with Alzheimer’s disease or mild cognitive impairment, following phase 1a safety and tolerability testing in healthy younger people and phase 1b testing in healthy older people. “We chose NDX-1017 as our lead molecule based on its high potency, favorable safety profile and its ease of formulation and manufacturing,” said Kawas. Maintaining a broad development pipeline is important to Kawas, as she sees that having a number of assets provides both flexibility and increases the chance of success by having“ multiple shots on goal” (Fig. 2). M3 is evaluating the use of NDX-1017 in additional therapeutic indications, with a phase 2 trial in Parkinson’s disease planned for 2019. Because of its neuroregenerative mechanism of action, it could also have potential for other neurodegenerative diseases. “We also have additional compounds in our discovery pipeline for Alzheimer’s disease, amyotrophic lateral sclerosis and Parkinson’s dis- ease. We will also look at other mechanisms of action. Most of our pipeline will come from in-house discovery, but we may also license potential candidates in,” said Kawas. Fig. 2 | M3 Biotechnology’s drug development pipeline. M3 is advancing multiple product candidates for Alzheimer’s disease (AD), Parkinson’s disease (PD) and multiple sclerosis (MS). ALS, amyotrophic lateralsclerosis; IND, investigational new drug.